When you’re on a good thing, stick to it. 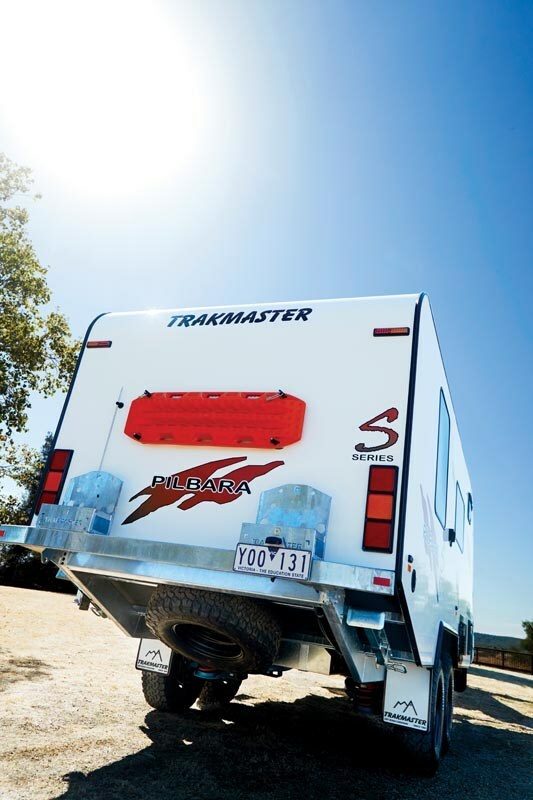 And that hackneyed phrase explains why Trakmaster resists breaking its iconic offroad mould (call it DNA) with the latest addition to its range of fixed-design offroad caravans — the Pilbara S Series. Certainly, the high-end, fixed-format tandem-axle offroader CW recently witnessed in the flesh looked right out of the ‘family tree’. DNA is what makes you unique, and there’s a definitive heredity about the Pilbara S Series. Unquestionably, this model exhibited all the ancestry of a Trakmaster. Smooth as silk and voguish on the inside and hard as nails on the outside, the 5.62m (18ft 5in) Pilbara S Series we tested is purpose-built for single-minded outback exploration — designed to tackle the harshest environments. 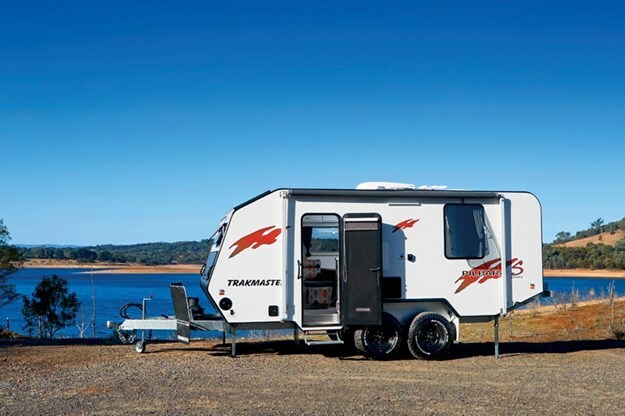 It’s ideal for out-of-the-way travel and lengthy off-grid escapades given its self-sufficiency — including 2x120Ah AGM deep cycle batteries, 300W of solar, 2x82L independently plumbed water tanks, 150L Vitrifrigo compressor-driven fridge/freezer, and ‘Trak-One’ trailing arm independent coil spring suspension with twin shock absorbers. And it rides on 16in Black Trak ROH steel wheels, with 265/75 R16 BFG all-terrains, and 12in electric brakes. I’m also a big fan of the Pilbara’s high departure angle courtesy of its extreme rear cutaway, and increased ground clearance due to its ‘Newgen’ (hot-dipped, galvanised) chassis design. And it also has a surprising amount of internal space. Quite simply, this bullet-proof battlewagon displays the physical characteristics of its predecessors. Call it congenital traits — a similar genetic makeup! The Pilbara under review also revealed out-of-the-square thinking, from its compressed fibreglass panel (side walls) and meranti (front and back walls) frame and fibreglass cladding, to its impenetrable undercarriage protection. 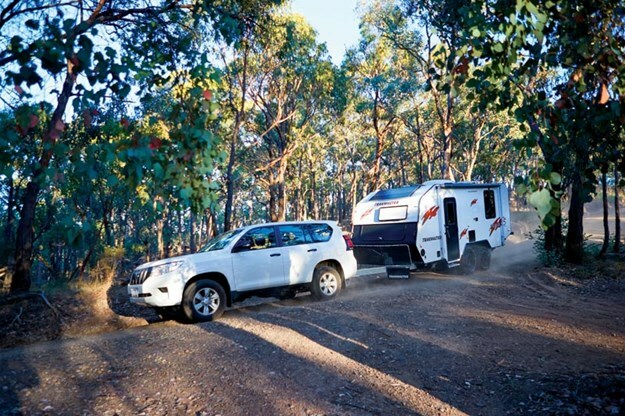 Aside from the obvious external attributes aforementioned, the Pilbara S Series boasts a bomb-proof 150x50mm RHS full one-piece reinforced chassis (five-year warranty) with 200mm extended A-frame, dual padlocked MAXTRAX sand-tracks and mounts on the rear wall, along with two jerry can holders, an easily accessible underslung spare wheel (with a wind-up ratchet) mounted under the rear cutaway and high level ancillary stop/tail/indicator lights. There's also a Truma Aventa rooftop-mounted reverse-cycle air-conditioner, Dometic S7P double-glazed side windows (with integrated block-out blinds and flyscreens), Camec Odyssey Premium three-point locking entry door with double-glazed window, single manual pull-out entry step, full-width cylindrical pole carrier, Dometic 8500 Series rollout awning, solar input socket (for direct connection of additional portable panels), concealed gas bayonet, LED annexe light, and an external access hatch to the fridge plumbing. 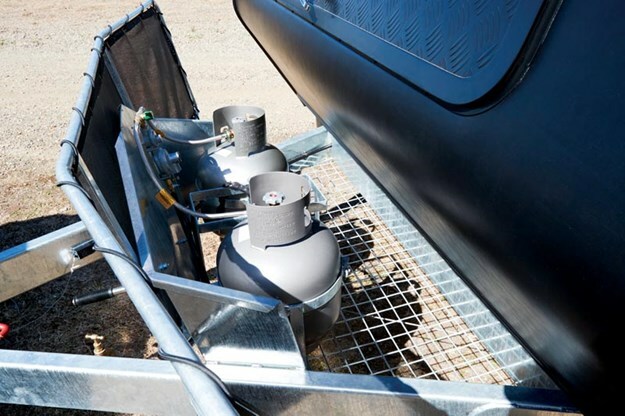 Additionally, there is plenty of protection up front — including a full-width truck mesh stone protection shield, with 2x8.5kg gas cylinders sitting behind (above a mesh tray) on the A-frame, high ‘Tebbtuff’ foamed vinyl, and a window with protector. The van’s front also comprised a new self-lock Hitch-Ezy 3.5t coupling, Breakaway brake safety switch, deep lockable front boot, mud flaps, grab handles, a water tap sensibly located on the inside of the drawbar, and a solar panel mounted atop of the aerodynamic front wall. And it goes without saying, the new Pilbara S decals hit the spot aesthetically. 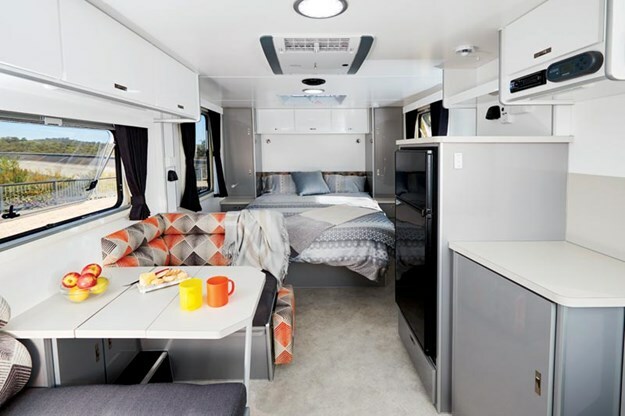 Inside, the Pilbara S Series is modern and plush, with intelligent utilisation of internal space highlighted by an L-shaped kitchen and a dinette that converts to a single berth. And much nous has also gone into the interior decor and its colour scheme, along with pelmets and curtains. Immediately left of entry, the L-shaped kitchen and its gloss acrylic cabinetry, with positive-close latches, are the ‘cat’s pyjamas’. 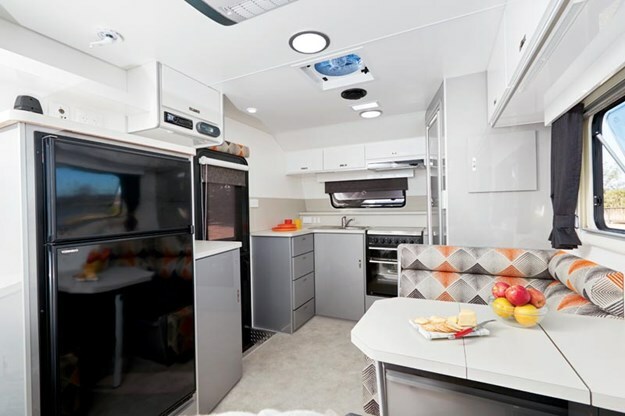 It comes with a Swift four-burner gas stove, grill and oven, Sphere digital rangehood, LED strip lighting, Modena stainless steel sink with tap and drainer, generous Laminex benchtop space and storage, but surprisingly no microwave (campers with a no-fuss culinary bent would be disappointed). Immediately right of entry, there is more benchtop space above a two-tier wire basket pull-out pantry and a cupboard with three shelves, while above this space is a Redarc monitor, AM/FM radio/CD player with front USB connection, and an overhead cupboard. Adjacent is a 150L Vitrifrigo compressor-driven fridge/freezer with a benchtop above, plus two USB ports, an antenna port for the Winegard Sensar HV wind-up TV antenna, and a double powerpoint. And the red-carpet treatment continues courtesy of a classy cafe dinette, with flip-out padded footrests and LED strip lighting, pretty much midriff on the offside wall. There’s a storage compartment under the bifold table, along with a double powerpoint and two USB ports. The batteries and Redarc battery management system are located under the seating, and above are three overhead cupboards (one housing the electrical suite). Wedged between the kitchen and dinette is a combo shower/toilet (plenty of elbow room), with a towel rail above the toilet. The combo shower/toilet ensuite consists of a full-height one-piece moulded fibreglass shower and Thetford C402 cassette toilet. The palatial rear bedroom features a lift-up island double bed (6ft 5in x 4ft 6in), gas-strut assisted, plus bifold mattress with slide-out base, panoramic windows (also with pelmets/curtains), three overhead cupboards, two wardrobes (each with a slide-out drawer and cupboard below), two corner cabinets, and two reading lamps. And there’s a Four Seasons hatch directly above the bed. However, the wheel arches do encroach on space getting around the bed, making things slightly cramped. The internal stakes keep rolling along with a scupper vent to fend off dust ingress, a 12V Fantastic roof vent, two internal speakers, and a footwell adorned in silver checkerplate. And hot water is reliably supplied by a 23L Suburban gas/electric unit. Meanwhile, the only noticeable absentees in this first-rate caravan are a washing machine, microwave, sway control, reversing camera, exterior shower, grey water tank (provision for 80L grey water), external kitchen (provision for slide-out barbecue or Weber) and fold-down picnic table. It should be noted, however, that all of these are available options. Footnote: We took the van initially through tranquil Sugarloaf Reservoir Park and then on to nearby Christmas Hills and Smith’s Gully, in Melbourne’s Yarra Valley, which is hardly bona fide offroad territory. Obviously, it simply glided over the dirt tracks! Ironically, I sensed it was yearning for such testing topography as the red earth of the Pilbara and its ancient landscapes in the north of Western Australia. This Pilbara S Series model also gloats a massive 930kg payload. 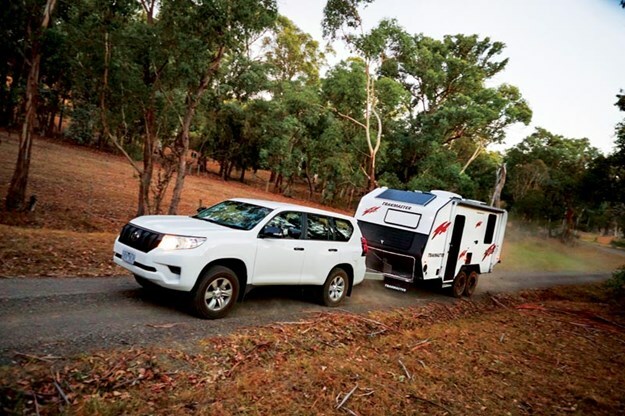 We towed it completely unladen (Tare 2470kg) with a Toyota Prado GX (3t capacity), but given its hefty carrying capacity you’ll legally require a Toyota LC200 (3.5t capacity) or equivalent. 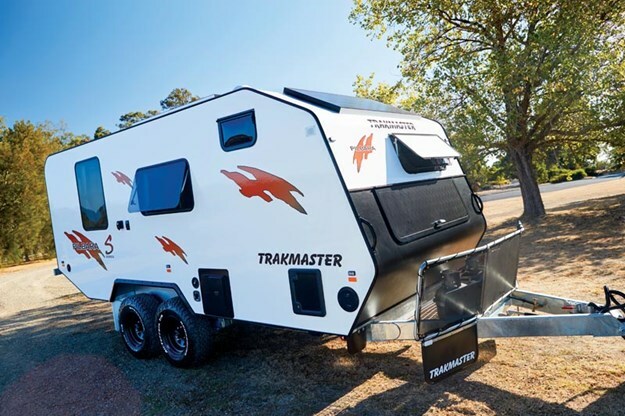 You can read more on the Trakmaster Pilbara S Series and how it loves to hug the coastline of its namesake state, in the next edition of Caravan World (issue 580). It was part of our team’s recent Coral Coast convoy, up from Perth to the rugged Karijini National Park, and we got a great insight into what life on the road is really like in a Pilbara S Series van. The $105,000 price tag, as shown, certainly catapults the Pilbara S Series into the high-end realm. However, what you get in spades is external rigidity and a dollop of internal opulence. And importantly, the ‘transmission of hereditary characteristics’ is still evident in such fixed-design Trakmaster-built offroaders as the Pilbara S Series. Given time, I predict that these fixed-format descendants will also be a self-replicating offroad generation for this visionary company. Time to bring some Darwinism (aka Darwinian Theory) into caravanning ­— they will certainly survive and evolve by natural selection. No doubt, Trakmaster's genetic ‘wheel print’ lives on! 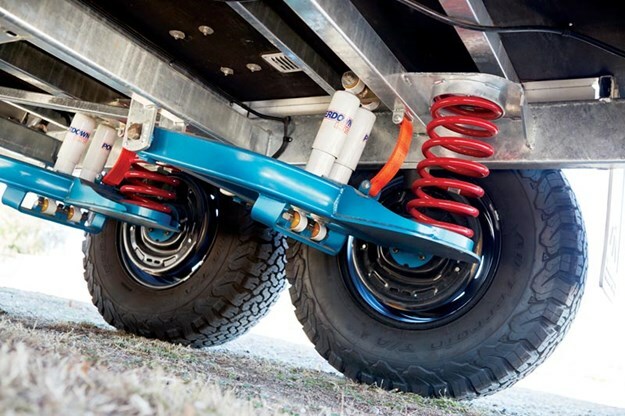 And in that regard, the Pilbara S Series is typical of its fully customised offroad progenitors. Yes, ‘the apple doesn’t fall far from the tree’.